Hailing from Sydney but now residing in London, Producer songwriter Craig Beck, aka Skybaby Siren, has been an established artist and writer for years. After finally deciding to start investing in his own music, he began releasing tracks periodically as an outlet from his usual work producing music for others. A multi-instrumentalist he see's the value in collaborating with singer-songwriters to enhance the music he composes and hopes that this somehow strikes a chord with music lovers. 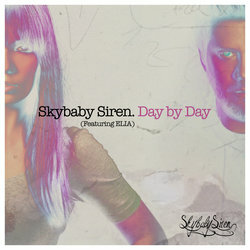 The previous release, ‘I Love Everything About You’, was co-writen and was the first Skybaby Siren track to feature Elia. Elia is a singer/songwriter from Melbourne. A graduate of the Australian Institute of Music, Elia's music style is mellow electro containing influences of Contemporary Jazz and Popular music. Since her first release in 2013, Elia has been composing all genres focusing mainly on top line work. It was through this work she began collaborating with Skybaby Siren. It’s a sleekly produced track, that shows off the act’s typically 80’s influenced style, with hints of the serene pop of modern dream rockers DIIV. Elia’s cool vocals float through the song, ushering in the infectious harmonies of the track’s smooth chorus.